Literary manager | Producer | Ken Atchity: AUTHOR INTERVIEW – BILL BORCHERT – HOW I BECAME MY FATHER ... A DRUNK! AUTHOR INTERVIEW – BILL BORCHERT – HOW I BECAME MY FATHER ... A DRUNK! There are a few times in life when you meet someone and you just know it’s an honor. You are not sure why you deserve the honor, all you know is that it’s here, you are presented with it and now you better use it. This is how it feels to interview someone called William G Borchert. Willian – or Bill as many know him was nominated for an Emmy in 1989 for Screenwriting the commendable Warner Bros/ Hallmark hall of fame movie, My name is Bill W.
The film starred James Garner, James Wood and Jobeth Williams and was based on material gathered and personal interviews. Bill also wrote “When love is not enough,” starring Winona Ryder and Barry pepper. 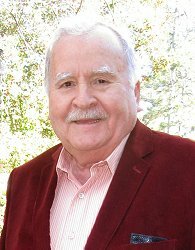 Over the years he has written a number of books, "The Lois Wilson Story: When Love Is Not Enough, Sought Through Prayer and Meditation, 50 Miracles That Changed Lives," and "1,000 Years of Sobriety." Bill, thanks so much for setting out some time to share your story with our readers. 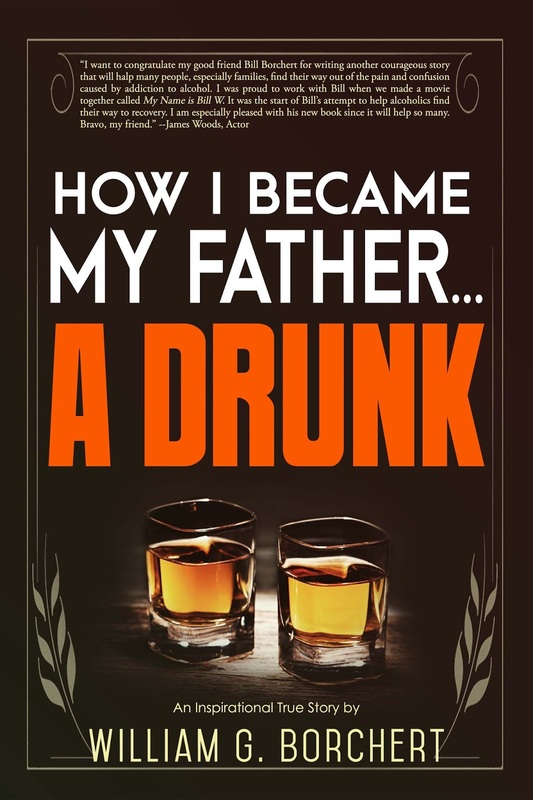 Your latest novel is a very intimate journey called, “How I Became My Father…A Drunk.” Can you tell our readers more about your journey and why you decided to share it with the world? WB: There has been one primary goal of my journey over the last 50 years or so as a writer who has recovered from the disease of alcoholism. That goal has been to share my experience, strength, and hope with others suffering from the same malady to show them from my own personal experience that there is a pathway to recovery and a life beyond their wildest dreams. There was a time as a young man when drinking meant fun, parties and freedom. It enabled me to do things I was too shy or too timid to do sober. I thought it made me a better dancer, a better writer, a better lover. It was my friend until it turned against me and began taking away everything that was near and dear to me in my life. Then it tried to kill me. That’s why I willingly share my story with others going through the same thing—so they can find what I have found, a new way of life. However, my new book, “How I Became My Father…A Drunk” is one I never intended to write. I guess I didn’t want to re-live a rather painful and shameful past after years of making peace with it and with those that were involved. But when several very close and loving friends, including my wife, convinced me that my experience growing up with an alcoholic father and then becoming an alcoholic myself could help families better understand the disease and its solution, I put pen to paper. Alcoholism, like many addictions, is a disease many humans can’t comprehend. How much of what you suffered was heredity? WB: From my own personal experience as well as from sharing with other recovered alcoholics over some years now, I’m convinced that alcoholism is definitely a family disease. First of all, science has discovered that it’s in the genes. They say that anyone with one parent who is alcoholic has a 40-50% chance of becoming addicted themselves. If both parents are alcoholic, there’s an 80-90% chance that one or more of the children will follow suit. Not only is alcoholism hereditary, it is also environmental. What I mean is, the shameful and harmful behavior of every alcoholic affect, at least, seven other people in their lives—parents, spouses, children, other relatives and friends and even co-workers. So, with more than 40 million alcoholics in the United States alone, that means more than 250 million people are impacted in some way by the disease of alcoholism and most don’t know what to do or where to go for help. That’s another reason I wrote my latest book—to show that there is a solution. How have you dealt with the part of society that doesn’t understand what an addict goes through or how he sees the world? WB: Despite the continued attempt by many in the recovery field to educate the world about the fact that alcoholism is a disease, there’s still a terrible stigma attached to it. Many people still consider abusive drinking a moral weakness or the lack of will power. That’s why so many addicts deny they are addicts and why this terrible denial keeps them sick, makes them sicker and sadly kills too many. I have been through this myself more than once. Even though I have become a successful author and screenwriter, I can still see people pause and reflect when, should the occasion call for it, I tell them I am a recovered alcoholic. So I keep on writing about recovery from addiction, hoping that someday it might help reduce the denial among alcoholics and lessen the stigma that surrounds them. The more people who come to know “the sober alcoholic,” the more the stigma will subside. At least, that is my hope. Has this book had any effect on others who struggle with alcoholism? WB; I am pleased to report that it has. Even though the book was only published three months ago, I am already getting emails and phone calls from people telling me how much they “identified” with my story, how much it helped them, their parents or siblings and how they are telling all their relatives and friends to get a copy. Some admitted they had a similar problem with a drunken father, swearing never to be like him and then becoming the same or worse. Several women said it was a drunk and abusive mother that caused the problems in their homes. I really wasn’t that surprised to hear those kinds of stories since, as I said before, alcoholism is a family disease. As a world class writer, your success continued throughout your struggle, how did you manage to focus on your work while the balance of your family had to live in the wake of your own destruction? WB: As we know today, alcoholism, like any other disease, only gets worse not better when left untreated. So as my disease progressed, my success digressed. By the age of 22, I had become a by-line feature writer for the largest evening newspaper in the world, based in New York City. I was covering and writing some of the major stories of our time. By the age of 25, as a result of my abusive drinking and erratic behavior, I was on my way out the door. I began bouncing from one job to the next, writing for magazines, radio shows, and small public relations firms. I tried focusing on my work. I knew I was a good writer when I was sober. I knew I was a young man who had been given tremendous opportunities to achieve significant success and financial reward in a career I loved. But I had no idea that my disease made me powerless over alcohol. I walked around with a mental obsession for booze that turned into a physical craving once I picked up the first drink. As a result, my whole life became unmanageable and my wife and children suffered the consequences. By the age of 27, I was just about unemployable in the media world of New York City. I had developed a reputation as an unreliable drunk who turned in phony stories and cheated on his expense account. I was deeply in debt, drank up two lovely homes and was now living with my wife and four children in my mother-in-law’s basement. Why my wife stayed with me I couldn’t understand. I would have been long gone. But she says she still loved me and prayed that the good Bill she knew was deep inside would one day come out. And I thank God every day that her mother was kind, generous and understanding enough to take care of my family when I couldn’t. I also thank God for being able to make amends to them all when I finally got sober. If you grew up feeling the power of addiction, seeing the dark veil it had over yourself, your family—what made you fall into the same trap? WB: That’s a question most addicts, if not all, find almost impossible to answer—at least in a way that non-addicts can understand. You would think, for example, when an alcoholic reads in the newspaper or sees on TV that a drunk driver killed three small children as they were crossing the street that he would never again get behind the wheel when he’s drinking. But he does. Alcoholism is a three-fold disease. It affects one physically, mentally and spiritually. It’s that mental part that triggers the kinds of decisions and actions that can lead to disaster—the kinds of decisions non-drinkers cannot understand. But neither can the addict. I promised myself I would never be like my father. But one night in a crowded saloon, surrounded by the camaraderie of other newspaper reporters, I gave in to the peer pressure and had a few drinks. Little did I know the exuberance I felt was from my alcoholic genes coming to life. Those damn genes told me I could handle few drinks now and then, particularly on special occasions. They lied to me. Soon every day was a special occasion. Soon one drink was too many and a thousand weren’t enough. As a result, there were many things that I began doing over and over again that I never wanted to do in the first place. But I was now powerless over alcohol. My body craved it. And once I took that first drink, all bets were off. When did you know you wanted help? WB: As I began to feel things slipping away and couldn’t understand why I was unable to stop drinking, I tried many different ways to help myself—taking pledges, pleading with God, going to church, trying harder to focus on my job and on my family. But nothing worked. Things continued to get worse. It wasn’t until thoughts of suicide started to invade my booze-soaked brain that I finally reached out beyond myself for help. I discuss that period of my life in some detail in my new book. How has this mindset changed your life? WB: Despite my thoughts of suicide, deep inside I knew I really didn’t want to die. The real problem was I didn’t know how to live. I had no goals, no direction, no guidance and no support. All I had was fear and a lack of hope. Then I came into a Twelve Step recovery program. I was now ready to admit I was powerless and willing to do whatever it took to get sober and stay sober. At the suggestion of a sponsor, an older man who had nearly experienced his own demise from booze, I made a decision to turn my will and my life over to a God of my own understanding. Gradually a whole new pathway opened up. Through the Twelve Steps of recovery my thinking changed, my actions changed and I was able to once again use in a positive and productive way the talents I had been given. Today I live an entirely different life, one that is truly beyond my wildest dreams. Do you feel you have been given a final chance at life? WB: I no longer think about fate or how much longer I might be around. Therefore I don’t see anything, be it life, work, relationships or even the lottery, as a final chance. I try to live my life one day at a time, not in the past or in the future but in the now. However, the one thing I am absolutely sure of is—to drink again is to die. When you realized this is it, you want to live, what did you decide to do with your life? WB: In early sobriety, my brain was very muddled. I just hung in there and tried to follow the suggestions of others who had much more sobriety such as the man I had asked to be my sponsor in recovery. One of the most important things I was told was not to make any major decision during the first year of my sobriety. As the mist cleared, I knew I wanted to write again. I did, and after a while became rather successful as an author and screenwriter. Then one day I came to realize what a great debt I owed for this great gift of sobriety I had been so freely given. That’s when I began to dedicate myself to writing books and movies about recovery from addiction, hoping that others might find the unbelievable life I have found as a sober man. It has given me the kind of satisfaction that money can’t buy. Has writing been a big healing point in your life? WB: When you are able to do what you love to do in life, I believe it makes you happy, healthy and very grateful. At least that’s what has happened to me. So yes, my writing has not only been healing but it has helped expand my horizons far beyond where they were when I was nothing but a selfish, centered alcoholic pounding on the bar in a sleazy saloon for another drink. How much does sharing your journey as a well-known artist contribute to the sales of your books? WB: That’s a difficult question to answer. I guess when people read one of your books and enjoy it that may prompt them to buy another. I have met people who told me they have read all my books and seen my movies. I also know that many well-known major authors have large followings. So I guess the answer is yes. Are there any events where people can reach out to you? WB: When I am asked to speak at business, professional or social meetings or conventions or hold book signings, these events are usually posted on Facebook or on my website, williamborchert.com. What’s next in line for Bill? WB: There’s a major film producer already interested in making a movie based on my new book, “How I Became My Father…A Drunk.” In the meantime, I am finishing several magazine articles and meeting my commitments for a number of speaking engagements. Then I’ll take a deep breath and choose from four very interesting ideas what will be my next book.My wife, Bernadette, says I’d rather write than breathe. But we always manage to spend some fun and loving time together. Where can readers go to buy your books? Should they like to purchase any of my books, they can do so directly from my website or they can find most of them in bookstores as well as on Amazon.com, Hazelden.com or Hallmark Hall of Fame.com. There is one exception however. My new book, “How I Became My Father…A Drunk” can only be purchased from Amazon.com or from my website, williamborchert.com. Do you have any place where people could contact you or someone who may feel they need help? Definitely. I can be reached by email at: williamgborchert@aol.com or on my cell phone: 843-855-9747. And I always answer or return messages since there was a time when I needed to reach out too.